From shish touk to falafel, Tarbouche, a new kiosk in Koramangala offers grilled meats, paneer and vegetables to be rolled up in pita wraps or eaten as is. For the broke but fabulous. The most expensive dish on the menu — the lamb kebabs — cost a mere INR 140. If you are looking for a quick and filling snack, then you need to head to Tarbouche. This is just a small kiosk, so there is no ambience to speak of. The wait staff wears funky Turkish hats though. The kiosk is really close to the JNC lane, so we are guessing students are going to flock here during meal times. Try the Chicken Ellai, cubes of chicken marinated in light spices and grilled and then stuffed into a pita wrap or you cane at it as it is. Everything is made fresh here and grilled right in front of you. 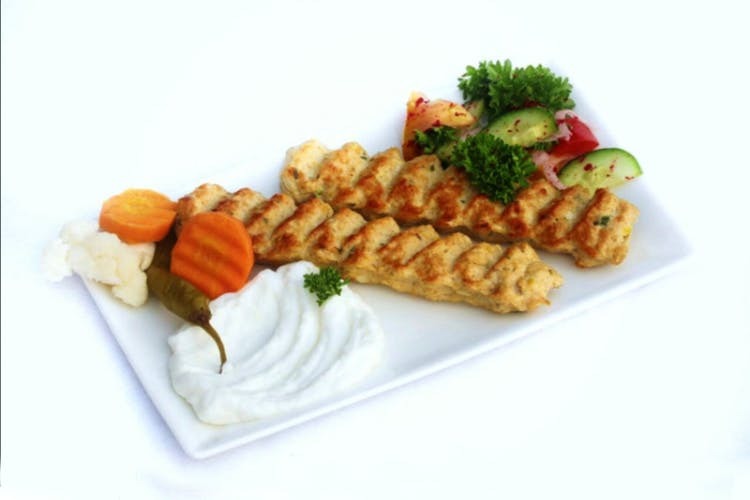 You can also order the Shish Tawook, available in chicken and lamb versions. There is also paneer Shish Tawook and Falafel rolls for vegetarians. Tarbouche also offers a separate menu for juices. Their Tender coconut juice is a specialty. Basically they make a juice out of the tender coconut pulp. Other kinds include orange, pineapple, watermelon, papaya and more. We love the the extra garlicky mayo in the rolls and the fact that they put a lot of fresh veggies and herbs such as cilantro, cucumber, tomato and onions. The service is quick, but since everything is made fresh, the meats take time to grill. chicken takes time to grill. Ask them to tone down the addition of garlic mayo in your roll because you take a bite and it might be disaster for your shirt.